Interactive Calendar has a powerful database search function. To find any text in the database entries, click the "File - Find" main menu item or use the Ctrl + F shortcut. Whole words only, Case sensitive, Search in description (if this option is off, the search will scope only titles). Click the Find button. 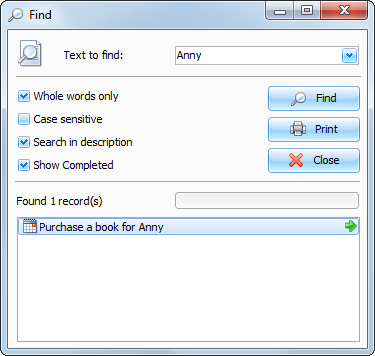 The search result will be displayed in the lower part of the dialog box. We've added an ability to print the search results. Just click the "Print" button.